Ryan and I were lucky enough to stop by my cousin Deb’s house in Connecticut for brunch on our way home from the season. Deb and her husband have the two cutest little boys that I had yet to meet, and brunch was the perfect stop on our way south. Deb is a health nut like myself, so I was a little surprised when she said she was making quiche. I didn’t exactly jump for joy. I kind of hate quiche. It’s so eggy and after making it for about 6 months at my job in Philadelphia, I know it isn’t the healthiest of breakfast entrees. But, I wasn’t the hostess, so we went and I secretly planned on eating something after we left. (If Deb reads this, she is just hearing about all this now). 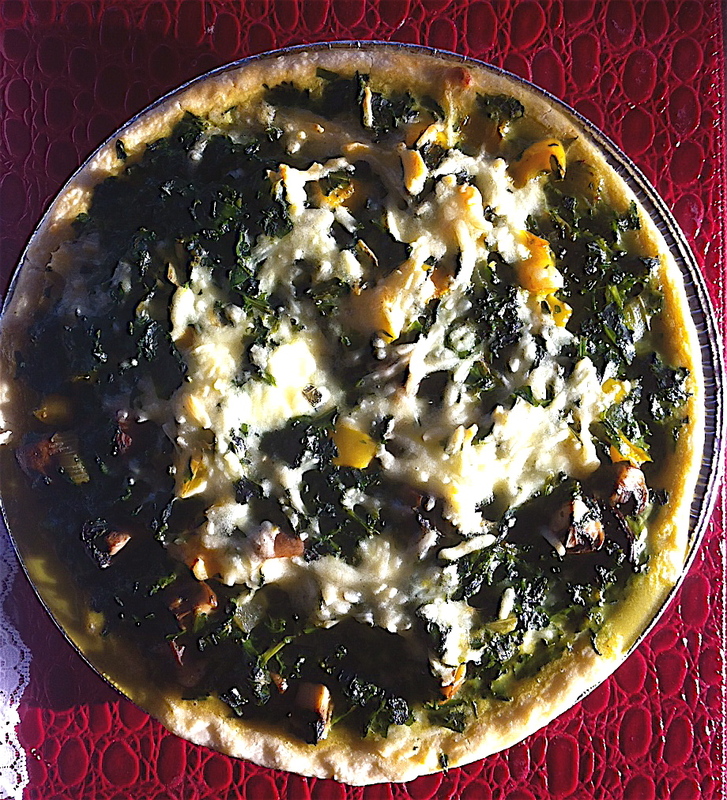 Boy oh boy was I surprised to sit down at the breakfast table and see a quiche FULL of spinach. Instead of egg with a dusting of green it was green with a dusting of egg! And it was delicious. She later told me there were only two eggs in the whole quiche! Tons of vegetables on top of a whole wheat crust and super easy to make on top of it. I borrowed the recipe once we got home, tweaked it just a little to add some things I love, and voila- “the yumminess that is the Spinach Quiche” as Deb put it in her e-mail to me. To make the crust, combine the flour, butter, and salt with your hands in a medium-sized bowl. It should be the consistency of wet sand. Press the crust into a pie pan (on the bottom and the sides) in an even layer. Bake the crust for 10 minutes. Remove from oven and set aside. To make the quiche, heat a large skillet on medium heat. Add the butter, onion, garlic, and shallot to the pan. Saute for 2-3 minutes, or until everything starts to caramelize. Add the mushrooms, spinach, and bell pepper to the pan. Saute for 6-8 minutes, or until all the moisture from the mushrooms and spinach is released and evaporated. Remove from the heat, season with the nutmeg, salt and pepper, and set aside. Whisk the eggs, milk, and 1/4 cup of the manchego cheese together. Use a spatula to fold in the spinach and vegetable mixture. To assemble the quiche, sprinkle 1/4 cup of the manchego on the bottom of the crust. Add the egg and vegetable mixture to the crust, making an even layer. Sprinkle the remaining 1/4 cup of cheese to the top of the quiche. Bake for 35-45 minutes, or until the quiche is firm on the top. Let the quiche sit, covered, for 10 minutes before serving. Previous postWhat to do with all that extra Halloween candy…..